In some cases you may want to provide a means for visitors to get prices for taxi journeys between locations you do not list using Cab Grid. Or, you may want to encourage customers to contact you concerning journeys where you have not (yet) entered a price. This article discusses techniques you can employ to achieve both goals. 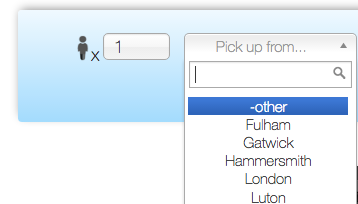 If you add an extra location to the AREAS tab on the Cab Grid WordPress admin page labelled ‘-other‘ you can indicate to visitors that they can select this option if their destination is not listed. You would not enter any prices for journeys to or from this other location. 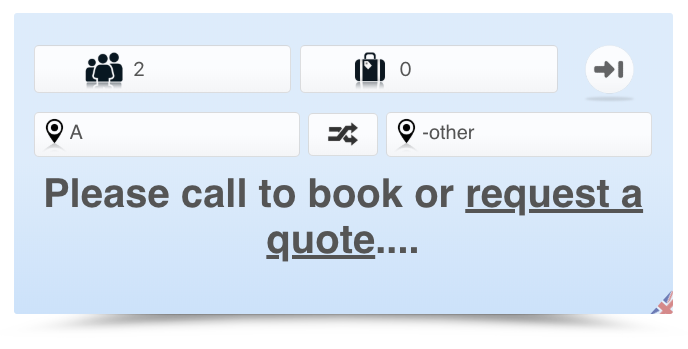 This way, when a customer selects ‘other’ as either their pickup or destination, the ‘no price’ message will be displayed instead of a BOOK button. Note: As with all areas, your ‘-other’ destination may be hidden from certain groups. See How to use groups. The message displayed to customers if no price is available can contain HTML. 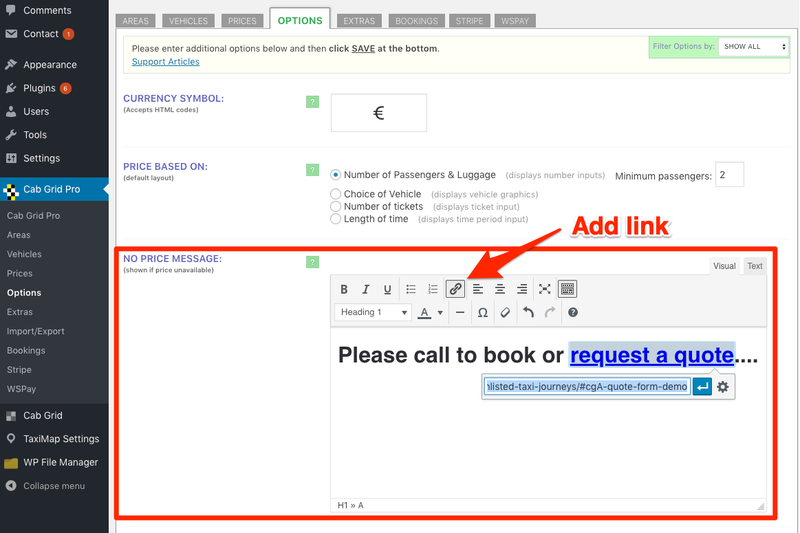 If a price is not available for the selected journey (or they have selected ‘other’ – as detailed above), you can encourage the customer to complete a custom booking request form. 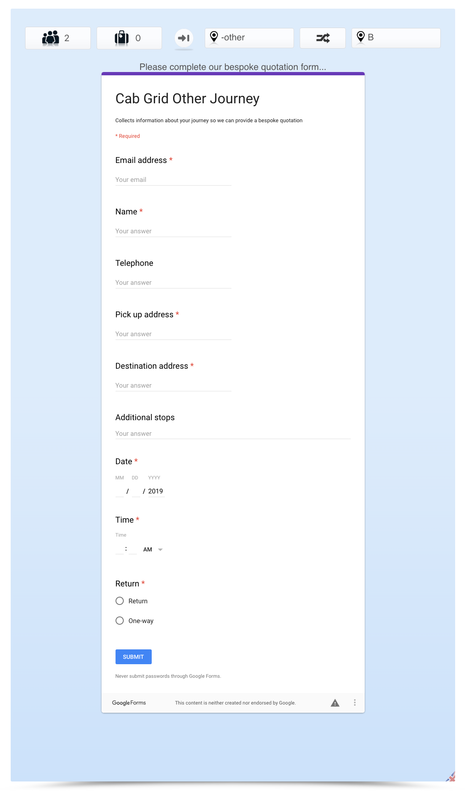 This form would be created by a third-party WordPress plugin (such as ContactForm7). With the edit box in TEXT (source) mode, code can be manually added as follows. Note: This needn’t only be for ‘-other’ destinations, if will apply to any journey for which no price is available (or has been entered in the admin). Whilst linking the customer to a dedicated quote page within your site allows complete control over the process, it is also possible to embed an externally hosted form directly in the ‘No Price Message‘ field. Typically, this would be form a 3rd-party provider such as Google Forms, WuFoo or JotForm. 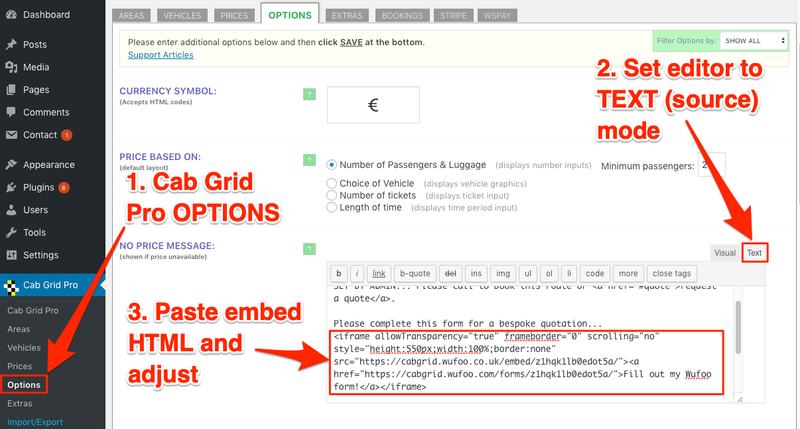 In the WordPress Admin for your site, go to the Cab Grid Pro OPTIONS tab. Locate the ‘No Price Message’ field and select TEXT mode. Adjust embed code as necessary (see below). There may be some adjustments to the embed code required. In our tests we have observed it is likely required to add a fixed height value to the iFrame style attribute (if using the iFrame embed method). Some providers will provide this value. It generally corresponds to the pixel height space required to display the whole form. Note, the techniques discussed here are incompatible if Hide Unsupported Destinations is enabled.